If you want a stylish, practical handbag that fits your laptop and personal effects in then I’ve done the leg work and found a range of bags for you. Each blog entry in this mini series about laptop bags is about a different size of laptop. If you like a big screen laptop like me then there is less choice of stylish laptop bags that will fit your lovely laptop in. 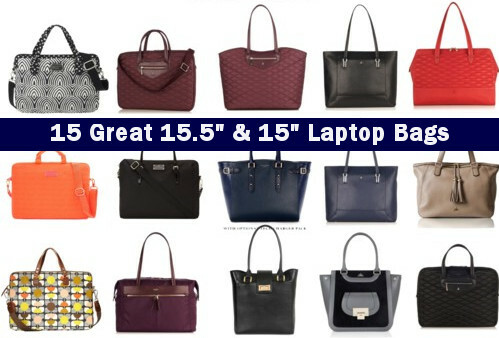 The following are the details and a breakdown of my top picks for handbags that hold 15″ and 15.5″ laptops. I have sectioned it by brand. I personally love all the Milli Millu bags. The Founder, Mireia Llusia-Lindh, has managed a very careful balance of attractive designs and practicality. My one criticism of the website would be the lack of filter to narrow down the bags by laptop size – this would have saved my disappointment of going through each bag and finding I only had one choice for a 15.5″, The Zurich. For a 15″ laptop from Milli Millu you have the option of The Rio or The Zurich. Two very different options, The Zurich is very structured and The Rio has a much softer laid back luxe look. Both bags have a great shoulder strap length which makes them both perfect for wearing over the shoulder. The Rio Handle drop: 23cm and The Zurich Handle drop: 20cm. The Zurich is a perfect handbag for a busy professional with its five separate compartments for laptop/tablet, papers, pens, smartphone and a zipped pocket for personal items. It’s always good to think about the security of your items when commuting so the zip at the top that closes the Zurich completes this bag. Knomo is another great brand that has really focused on providing a more attractive bag combined with the practicalities we all require! For the 15″ laptop you will find a larger range of options. Let’s start with the Great Portland and Portland Place – two very similar looking bags. The main difference is in the size of laptop you can fit in. The Portland Place can hold a laptop up to 17″ but only comes in black whereas the Great Portland can hold a laptop up to 15″ and comes in 4 colour options. They are both made from lightweight and soft nylon. With EVA foam and a double stitched diamond quilting. Are you wondering what EVA foam is and why it is worth mentioning?!! Yes so did I ….. These are probably my favorite bags from Knomo for combining style and function. Two stylish leather handbags that will both fit over the shoulder and easily carry your 15″ laptop and other belongings. Both bags have a quilted and padded compartment to hold and protect your 15″ laptop. The leather for both bags is quite different. Hannah is made from a soft pebbled leather and Picton is made from a hard durable Saffiano leather. Inside the Picton there is a panel in which you can store items like pens, memory sticks or business cards. A front pocket on the exterior is great for items like your Oyster card that you want to grab quickly. There is also an additional interior zip compartment – maybe you can keep some personal items in here. A nice long shoulder drop of 25 cm means Picton will easily sit on your shoulder. The sides of Hanna unzip for easy and maximum access to the main compartment. The handle drop is 24cm and will be very comfortable on the shoulder as they are made from padded soft pebbled leather. The top zip fastening adds that extra bit of security. Aspinal of London have obviously put a lot of thought into this bag design. With its mobile phone pocket and padded ipod compartment both designed with a cable path. The bag is designed to carry a battery charger for both mobiles and ipads, so you can charge on the go! But I wasn’t so impressed that this charger had to be purchased separately (£100). The bag is made of navy pebble textured Italian calf leather. The handle drop is quite short at 5.5″/13.5cm. So to me this is more of a grab tote or crook of the arm bag than an over the shoulder handbag. In addition to the padded ipad compartment and phone pocket there is a large main compartment and two external hidden pockets. The large main compartment means you should be able to get a laptop in too and potentially fit up to 17.3″ laptop in there – but I would check with Aspinal of London first. For added security the bag closes with a full length zip. Also available in deer (beige shade), black or black and cream. Or the option is there Marlyebone Tote which is the same size but doesn’t have the option to carry the charger or have the cable paths. It comes in brown or black. Another brand I am totally loving at the moment is Bobelle. Although the designer has not done a many work bag/laptop bags the styles and designs are gorgeous. Spacious enough for a tablet or small laptop (up to about a 15″ laptop), wallet and other accessories. The lovely suede lining is quite different to all the other grosgrain linings other handbags are wearing! The bag has a lockable external pocket, an internal zip pocket, an internal mobile phone pocket, pen holder and spare holder. The handle drop of 21cm is perfect for wearing over the shoulder. This is a smart looking laptop bag from Kate Spade. This is a padded nylon bag so it’s light and it has some smart patent leather trims. I really like the fact you have the two strap options – the long (23″/58.5cm) adjustable strap for across body or shoulder wear and the handheld handles (5.25”/13cm). The bag fits a 15″ laptop and you have room for more items in there too with an interior double slide pocket and middle divider. The bag style is more your traditional laptop case than all the others but it is smart and has a more subtle stylishness! Other brands for colour and patterns! You could go for a bright colour or nice pattern to jazz up your commute. Try Marc by Marc Jacobs or Orla Kiely. Some practical bags with some nice bright and interesting covers. So to sum it up, my laptop is 15.5″ laptop (screen size): is 27cm height and 38cm length. Really there aren’t many options at all for a stylish handbag for a 15.5″ laptop… it’s the Zurich from Milli Millu or the Marlybone Tech/tote from Aspinal of London. Hopefully your laptop is a 15″ or less! All my favorite Milli Millu bags come in smaller sizes! Please Milli Millu do one of your bags bigger because my laptop is a 15.5″ but won’t fit into your Zurich bag! Categories: Bags and Handbags, Smart Women's Work Accessories | Tags: accessories, handbag, laptop, London, Professional, stylish, Women, work | Permalink.